Oblique aerial view centred on the football ground with the apartment block adjacent, taken from the W.
General oblique aerial view centred on the football ground with the apartment block adjacent, taken from the SW.
NS56NE 1697.00 From NS 5807 6784 to NS 5825 6771. These old timber basins basically constitute the most under-utilised asset in Glasgow. 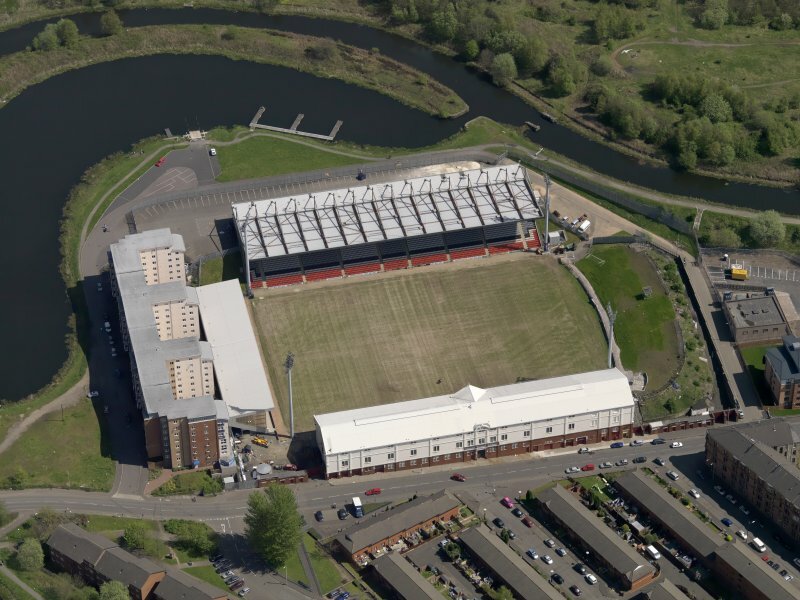 One basin has been created by widening the canal on the offside as it takes an almost 180 degree bend. A second basin, kidney-shaped, lies within the curve. Bridges which formerly spanned the basin entrances at each end have been removed and thus the towpath has become an island, creating an ideal habitat for city wildlife. 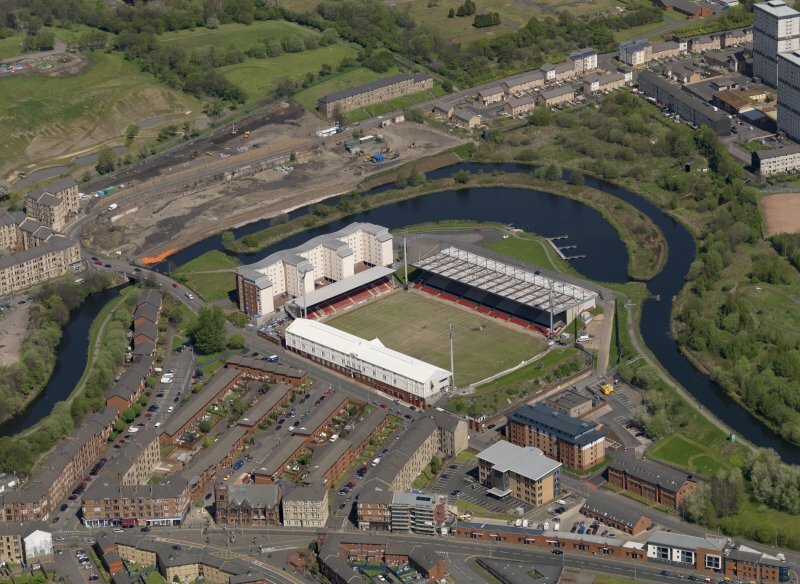 The inside curve of the basin next to Partick Thistle football stadium sports a footpath which rejoins the towpath at a point near to the E entrance to the basin. Inside this 90 degree bend a kidney-shaped basin was formed, the outside of the bend being widened to create a timber basin. An island was created by the towpath. The broad sweep of the canal in this section was widened in order to create a basin, a second kidney-shaped one being formed in the 'crook of the curve.' Other features of interest include a stranded section of towpath, created by the disappearance of the towpath bridges, and a small jetty and slip which allow young people the opportunity to practise sailing and canoeing. 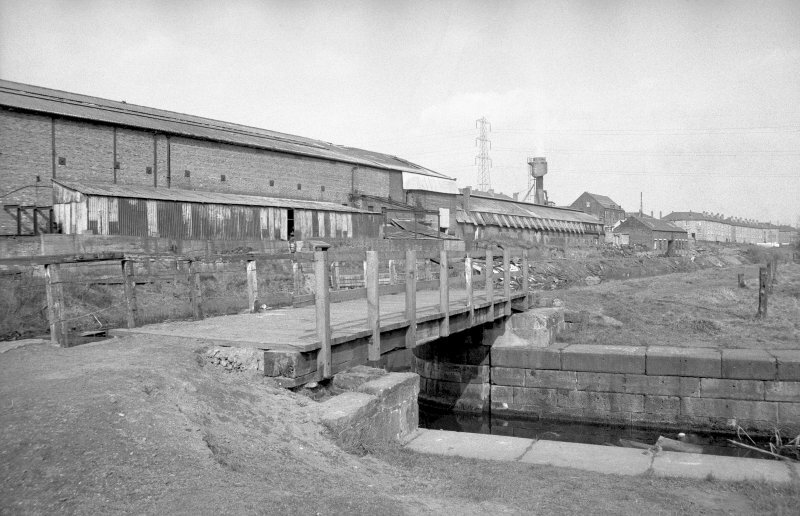 At one end of the basin a wartime stop lock was constructed. The purpose of this installation was to prevent possible bombing from breaching the canal. 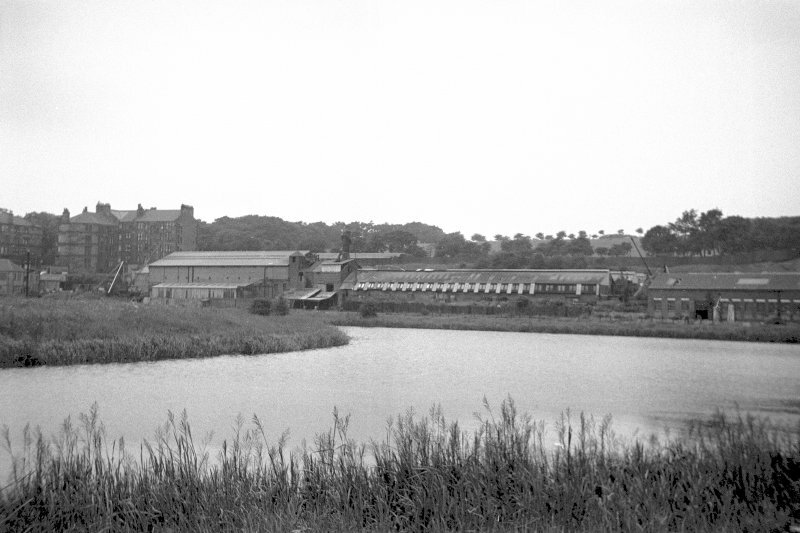 The large kidney shaped basin was used as a timber pond, as there were a number of sawmills in the Firrhill area. It is situated to the E of the Firrhill Bridge (NS56NE 1696). This basin is shown on the 1st Edition of the OS map (Lanarkshire 1865, sheet vi) as a timber basin, the smaller basin being clearly marked on the other, NE side of the canal. On the Current Edition of the OS 1:10 000 map (1984), it is possible that the wartime lock may be the feature shown on the canal, near the southern entrance to the basin, at NS 5825 6768. Information from RCAHMS (MD) 24 August 2000.